#30. Lake Lal, Uinta Mountains, Utah. 11 x 22, oil on canvas. "Gilbert Munger (1870?)" lower right. Similar to Plate VIII in Systematic Geology (see #148) and painting #23. 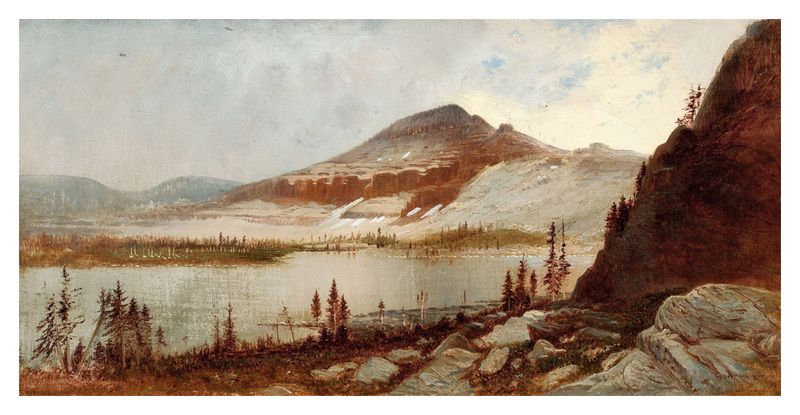 This painting descended in the family of Frederick Clark, a member of the King Geological Survey with Munger, until 2010. It was then sold at Heritage Auctions, Dallas, sale of 20 November 2010, lot #76398, for $12,000 + 19.5% buyer's premium. Munger was in the Uinta Mountains with the Survey in 1869. IAP 97440002. Image provided by Heritage Auctions.